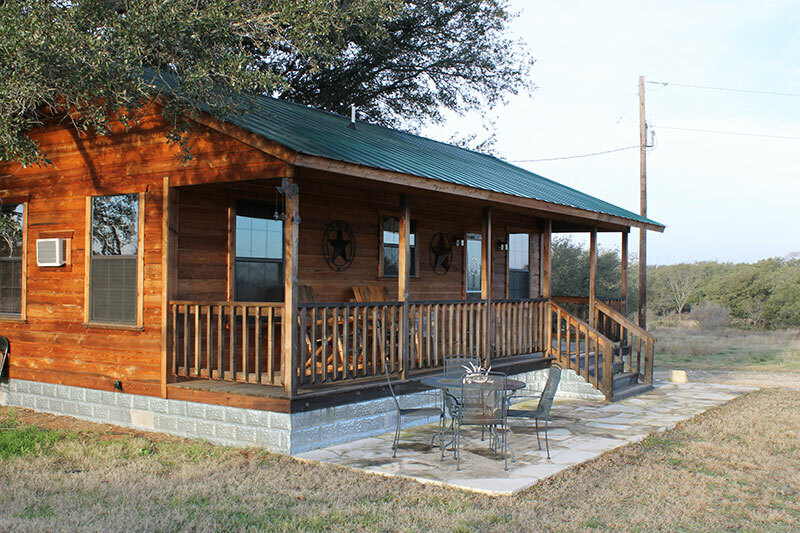 Our Guest House at The Ranch is located 7 miles from Johnson City and 25 miles from Fredericksburg, Texas, right off of Highway 290 between the two. 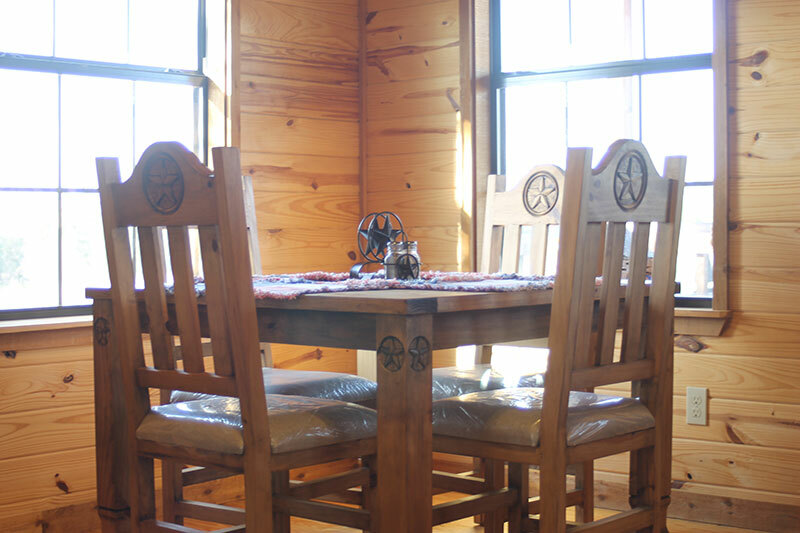 It’s a beautiful cedar cabin, built under a spreading live oak near a large private pond, all set on 100 acres for you to explore. 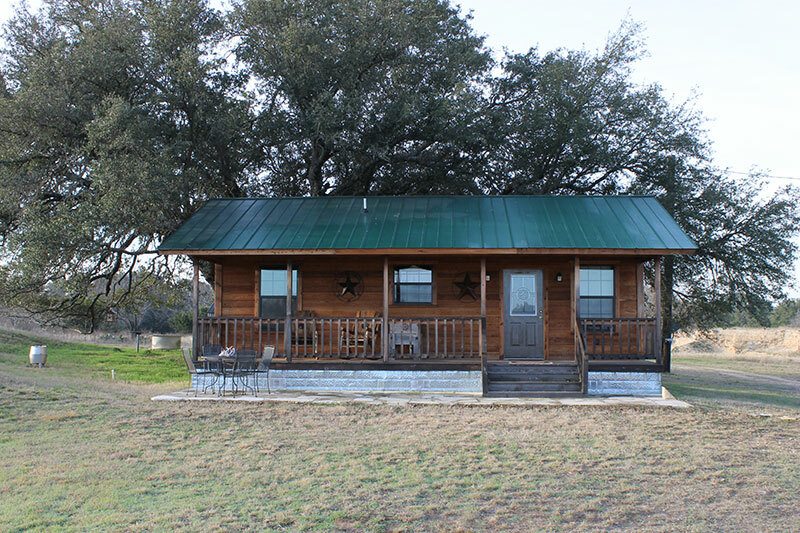 With a bedroom and futon, the Guest House at The Ranch can host 4 people for a secluded weekend getaway with nature or serve as a home base to visit all the attractions the Texas Hill Country has to offer. 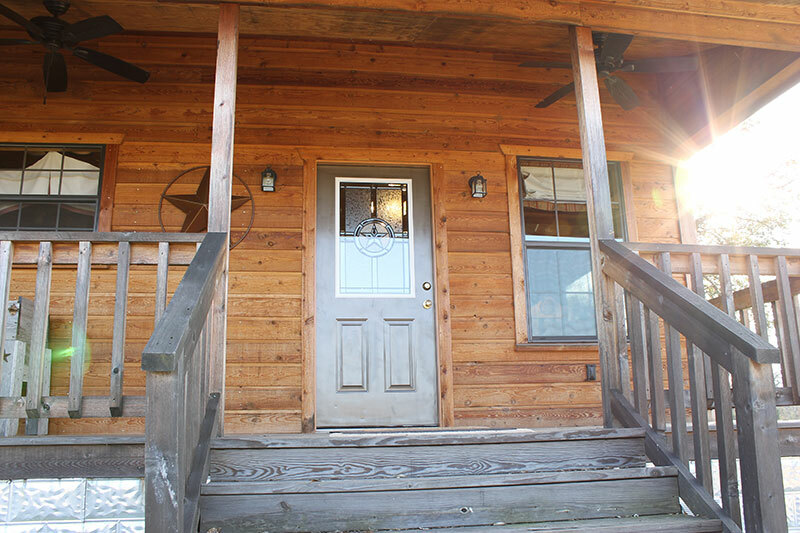 Our rental fee is $150 per night, with a two night minimum stay, and a $20 additional charge per person for a 3rd and 4th guest. The cabin was built in 2011 with a cedar exterior, large porch, and all natural pine decor inside. 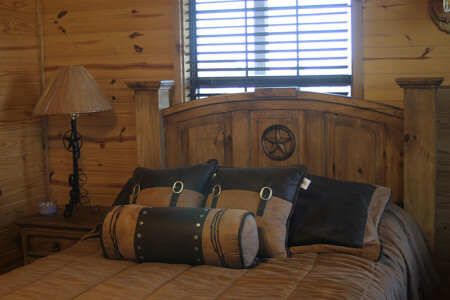 With rustic bedroom furniture and mounted whitetail deer taken on The Ranch, it’s truly reflective of the Hill Country. 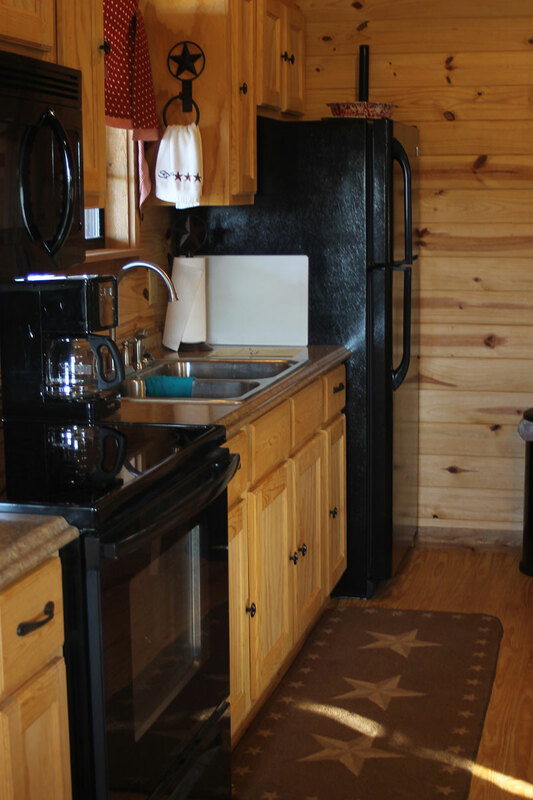 The cabin has a kitchen and dining area with full size range, stove, microwave, and refrigerator, plus all the kitchenware you need for meals. Or, you can use the large pit outside to grill or smoke a steak or brisket dinner. 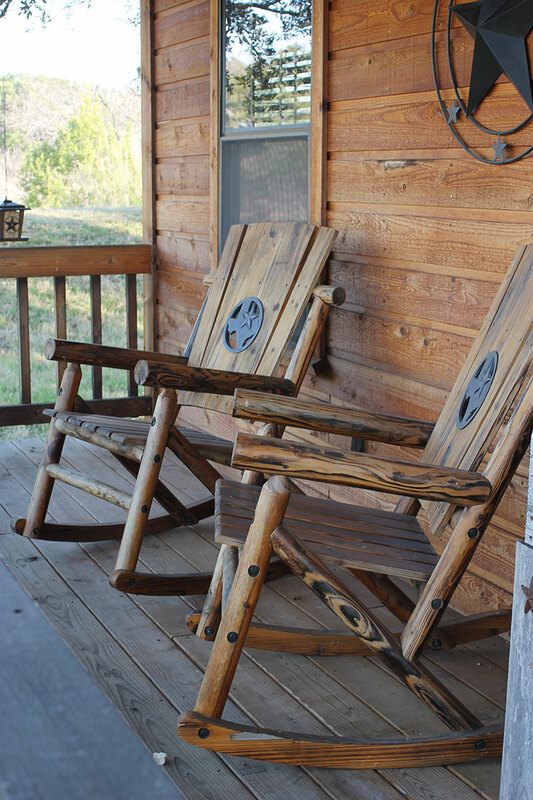 When you’re done fishing, hiking, and swimming for the day, enjoy the breeze on the porch or pitch some washers in the shade. 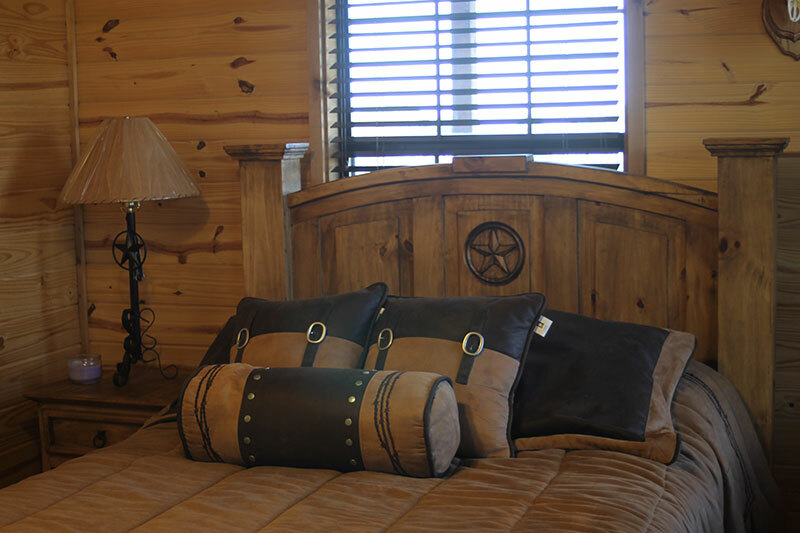 At night, you can relax in the air conditioning and enjoy the satellite feed and flat-screen TV. We’d suggest you watch the whitetails and turkey gather under the feeder outside your windows in the mornings and evenings. 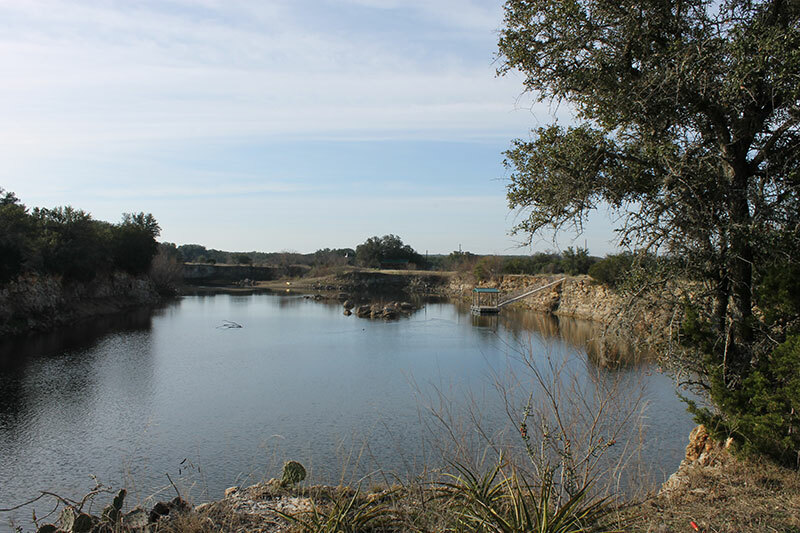 The pond (or tank, as we call them) was a large gravel quarry, used to make the road base for Highway 290 when it was originally constructed. 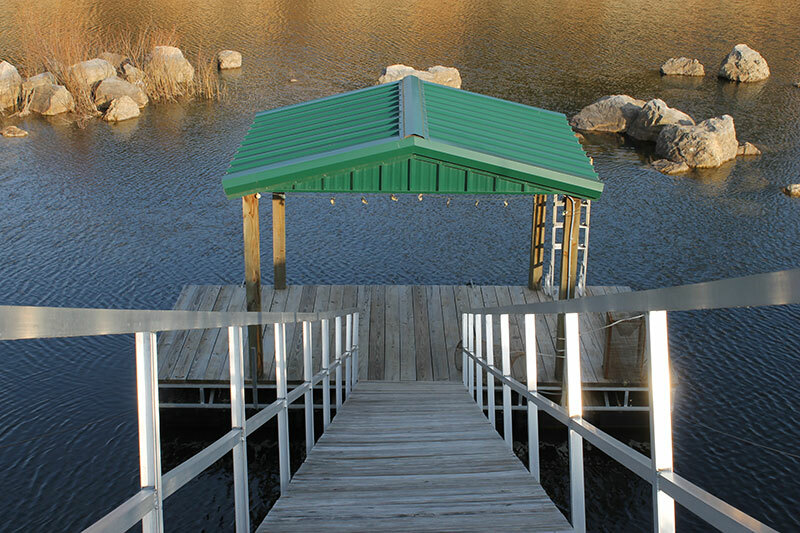 It is stocked with largemouth bass and catfish for your enjoyment – catch and release, please, so our next guests can enjoy them. 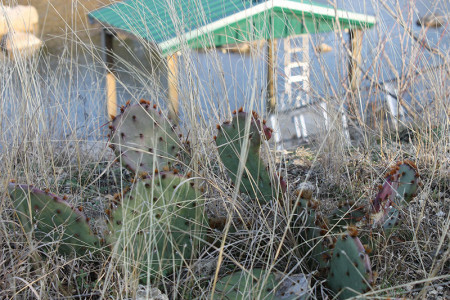 You can also hike anywhere on the 100 acre property, as well, to view the wildlife and unique cactuses and vegetation. You might see whitetails, turkey, Axis deer, raccoons, armadillos, and maybe a ringtail or grey fox if you’re lucky. 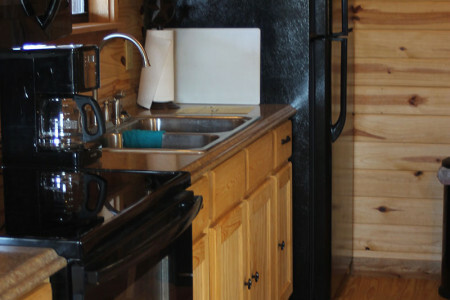 If you need a little bit of civilization, you’ll find everything you could want within half an hour of the cabin. 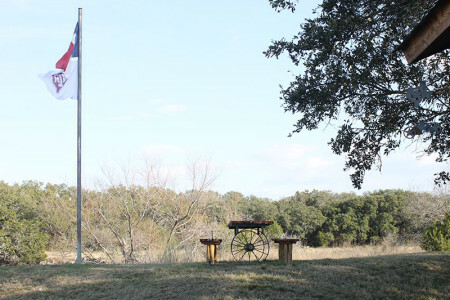 Head west on 290 toward Fredericksburg and you can taste some award-winning Texas bourbon at Garrison Brothers Distillery near our home ranch outside of Hye. The Hill Country near Fredericksburg is known for its vineyards and wineries, and William Chris Wines in Hye is a great first stop on your winery tour. One of the jewels of our area is the Lyndon B. Johnson National Historical Park near Stonewall, and it’s free to visit. 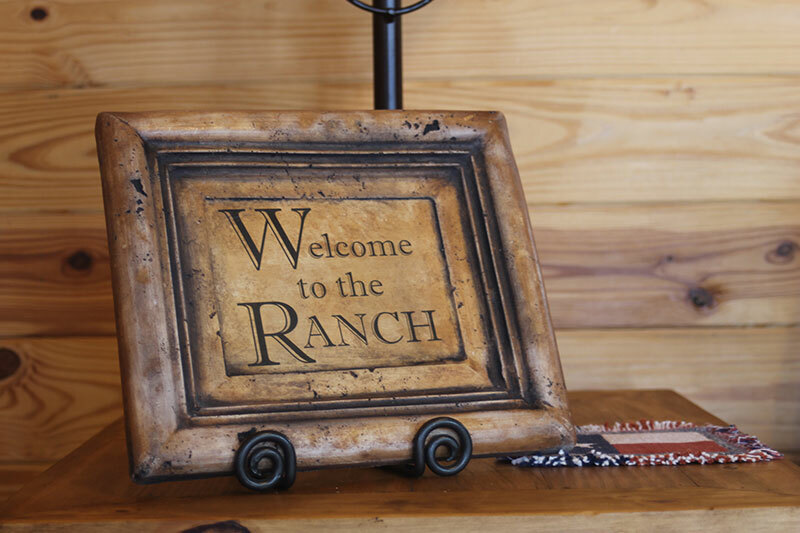 Once you get close to Fredericksburg, which is less than 25 miles from the Guest House at The Ranch, you’ll have no lack of wineries, restaurants, or nightlife to choose from. You can also get everything you need in the way of groceries from HEB or Walmart in Fredericksburg. It’s also less than 10 minutes to Johnson City from the guest house gate. Johnson City’s old grist mill and cotton gin was recently transformed into the Hill Country Science Mill, where kids can experiment with science first-hand. Pecan Street Brewing brews beer right on the historic town square, and it cooks up great food to enjoy with your drink. The town square is famous for it’s Christmas lights during the holiday season, too. The area around the square is home to local artists, wine tasting rooms, boutiques, antique shops, and other restaurants. Marble Falls is about 30 minutes from the Guest House at The Ranch, and beautiful Lake LBJ, one of the best Texas destinations for boating and fishing, is literally located within city limits. 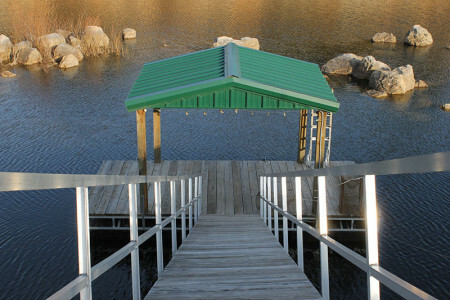 You can easily trailer your boat to and from the lake and our cabin. You can also start a mini barbecue tour with the famous turkey sausage at Inman’s Ranch House Barbecue in Marble Falls. But only get the sausage there, and head north on 281 a little ways to get great brisket and ribs at Peete Mesquite. 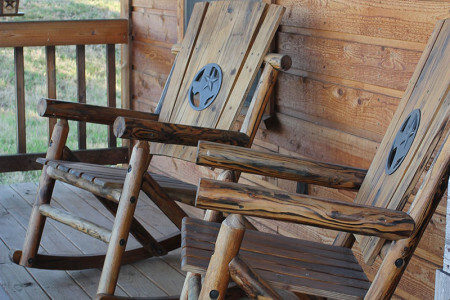 From there it’s only about 35 minutes to Llano and a stop at the famous Cooper’s Old Time Pit Barbecue. 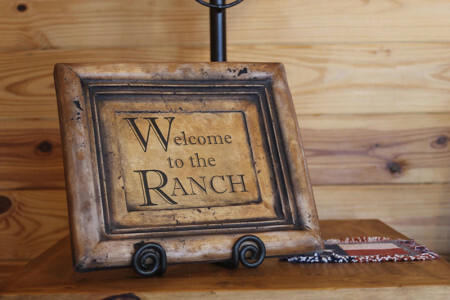 At our Guest House at The Ranch, you can choose whether you hide away from everyone else and enjoy our beautiful Hill Country setting, or you can enjoy everything our region has to offer – and we didn’t cover a quarter of it, here. Book Now!